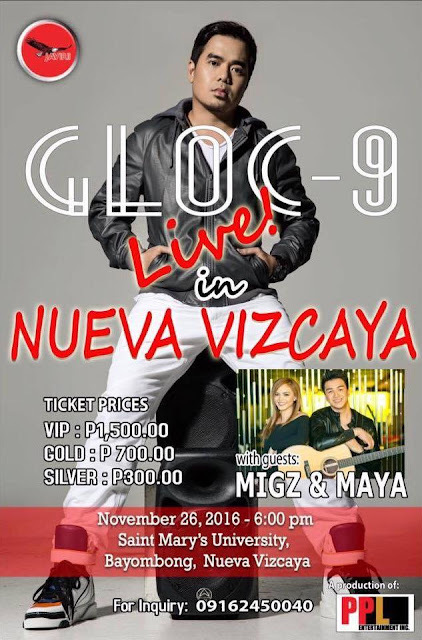 Famous rap artist Gloc-9 will be having a concert in Nueva Vizcaya on Saturday, November 26 at the Saint Mary's University, Bayombong, Nueva Vizcaya and starts 6PM. Gloc-9 is well known for songs which relates to real life situations like "Upuan", "Magda", "Lando", "Sirena" and more. Recently, he was in a concert tour in the Philippines and even in the United States. Gloc-9 is bringing his songs to more Filipinos. It might be a way to open up the eyes of his fellow Filipinos to the ills and realities of the country and perhaps instill some action. You can buy tickets for his concert at Bambang, Nueva Vizcaya at the following locations: Infinitea, Chicboy, Bambang Provincial Hospital c/o Dr. Arlene Jara. Tickets are also available in Bayombong at Saint Mary's University, Mayor's Office, DWGL Radyo Natin Radio Station, DWNS UFM Radio Station Solano - McDonalds. Another rising stars, Migz and Maya will also be performing at Gloc-9's concert. So what are their music like? "It’s kind of different and a little bit ironic, actually, because we’ve come from totally different backgrounds. I am more on pop, I sing and dance and he is more of alternative, more on singing acoustic and songwriting. With our music, you’ll hear a merging of two different artists," said Maya during an interview at Wish 107.5FM. Maya started here career in 2002 when she competes in :Star for a Night" and also in "Pinoy Idol," Migz on the other hand is a singer-songwriter who had tons of online viral videos. Then the two teamed up and created great music together. 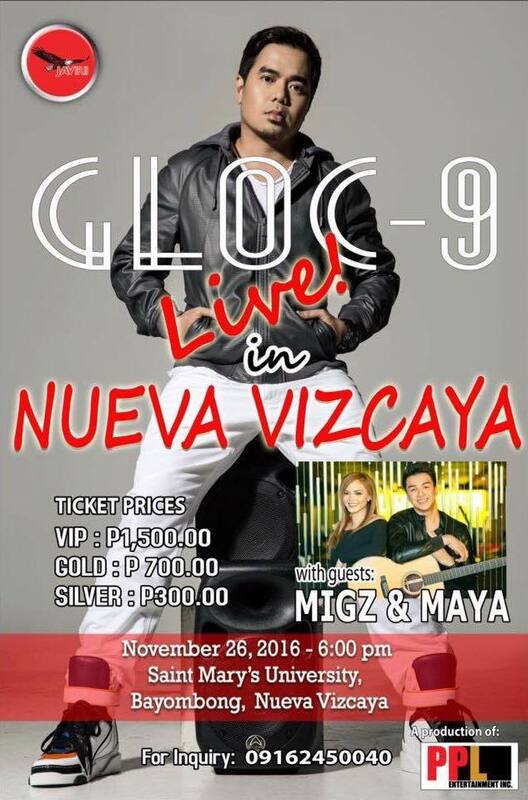 So there you go, Gloc-9 plus Migz and Maya will be a great weekend.